Snacks are a huge part of our day. Before I had kids I used to eat one to two large meals a day. Albeit, that was a long time ago but old habits die hard. Now it seems my meals just got larger because I’m eating not just what I make for me, but anything the kids leave behind too. Well, I feel like crap. Product received for review. Post contains affiliate links. But because I am a mom, among a thousand other things, I don’t always (okay, never) have the time to prepare healthy snacks to pick at all day. So, my mission for some time now has been to find convenient, nutritious and affordable snacks for me AND the kids. I’m so excited to have had the opportunity to review Fruition Bars from PROBAR. Each of them has a a full two servings of fruit and are certified organic snacks. The variety pack I received had the following flavors: Cherry, Strawberry, Blueberry, Peach, Cran-Raspberry, Lemon and Chocolate-Orange. I’ll be honest… I thought Chocolate-Orange would be gross as I am not a huge fan of fruit/chocolate combos. But, it ended up being my favorite flavor! They were all delicious but that one really surprised me. The feel of these is a bit wet, but not sticky and I think that is super important for on-the-go snacks. I cannot stand snacks that crumble all over your lap while driving or sitting at your desk. And worse, is getting your fingers all sticky when you’re not close to soap and water. 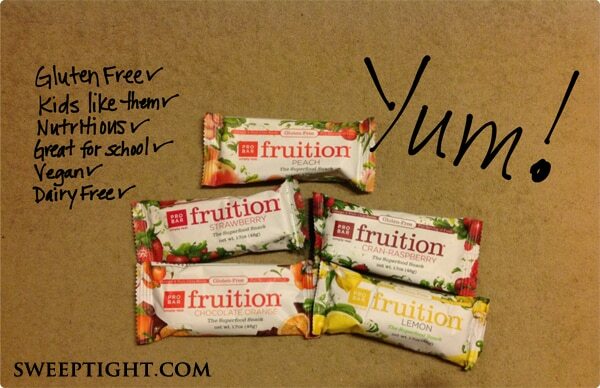 The best part… the kids like Fruition bars too! (And, they’re gluten free!) They are perfect for school lunches or anytime snacks. I keep one in my purse at all times! I’m always looking for healthier snacks and these look delicious too! These would make healthier snacks for myself and my kids. I would love to win these bars for my daughter who could use these healthy snacks at college, and the flavors are delicious. Always looking for healthy snacks that my family can grab and go…the site has other varieties I’d like to try like the PROBAR Sweet and Savory bars…YUM! They are plant based and I would love to give them a try. i want to win because i love that it is healthy and natural. i wouldn’t feel guilty after eating it. I’d like to win because I love fruit and they sound yummy 🙂 *Thanks* for the giveaway! I would like to win because I am hungry! I would love to win bc I crazzzzy LOVE fruit, even as a kid I use to say that fruit seemed like nature’s candy to me. I especially love that this prize is a variety box bc I am eager to have a chance to try ALL the flavors as they all sound sooooo delicious! Thank you to you and the sponsor for this opportunity. These bars look really nutrional and they are packaged to look like they taste great! I’d like to win because these are delicious and healthy snacks. I would like to win because these look like a delicious way to stay healthy! I’d like to win as I always lose. Would lovelove to win since yummy vegan bars are bars to find!! These look perfect for keeping in the diaper bag! i love the variety of flavors and the fact that they are gluten free! Halo bars sound super yummy! I’ve heard these are really good. I’d love to try their Peanut Butter Chocolate Chip , it looks delicious!! We are always looking for yummy snacks for on the go! I would like to win these because they are healthy snacks on the go! Would love to win because they all look so yummy and I need to eat healthier. I would love to win because they sound delicious, and I think that even my toddler would like them! I want to satisfying your sweet tooth with zero grams of guilt. I would love to win these because they would be a great switch from the fruit leather that I bring with me to pick my son up from preschool. He loves healthy snack bars. They are just so darn expensive. These sound delicious!! Thank you! I would like to win because I am always on the look out for a new healthy snack. I want to win because I LOVE PROBAR! I want to try the new Peanut Butter flavor!! I LOVE Probar! I’ve tried several flavors and love them all. Would love to win this. They look yummy and healthy too! I think these look like a great snack! I would like to win because I have never tried PROBARS and they look delicious. I’d like to win these as a healthy snack for my daughters! I would love to win because the bars are healthy and I love fruits! the peanut butter flavor sounds great! These would make great snacks! Id love to try the peanut butter flavor. I’d like to win because my husband is always taking granola bars and such to work, and these would be a great alternative! Would like to also win the Peanut butter chocolate chip bar! I like to try new healthy snacks. These sounds good! Hope I win. because they look delicious as well as healthy! I want to win because these seem like a great on the go snack. I want to win because they look YUMMY! I would love to win because I am always looking for a healthy snack! I like that they are all natural and not to mention look delicious! I would like to win these because these have natural whole food ingredients that will be great for my kids. I want to win because these are healthy and nutritious snacks. I like that they contain a serving of fruit with 4g of fiber. These bars look and sound delish and that’s why I’d like to win. These look great! I have 2 little girls and I can scarcely find time to eat, so quick, easy snacks are a must! I would like to win because I love eating healthy granola/fruit/energy bars when I’m on the go and these sound delicious. i would love to win because we are eating healthier and these would be a nice addition to our menu! I want to win because these bars look really yummy…I’d love to try them all, especially the strawberry! I would love to try the Chocolate Orange fruition bar; I adore that flavor combination! Their flavors look so scrumptious! I’d definitely like to try the superfruit slam! I would like to win because they look good and are healthy! Thanks for the giveaway…a great snack to take on a weekend hike. I would like to win because PROBAR Fruition Bars look very tasty!